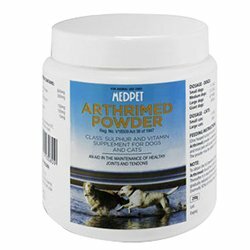 Arthrimed powder is a tasty oral treatment that aids the health of both cats and dogs. It improves the health of joints as well as tendons. This cure can also diminish the pain of arthritis. 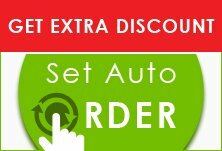 For well-being of the pet, this is highly recommended by the pet-owners. Arthrimed powder consists of various dietary supplements and vitamins that aid the joint health. The active ingredients present in this powdered solution are- Glucosamine, Chondroitin Sulphate, Green Lipped Mussel Extract, Ascorbic Acid, Manganese Ascorbate, Brewers Yeast, moisture. All these ingredients have a combined better effect on the cat and dog’s health of joints and tendons. Powder is easy to mix in food and give it my dog and cat. Both are aging and given this product surely helping.